We recently put together a really fun collection of 11 DIY Valentine’s crafts for preschoolers and young kids, and in the process of hunting, Kate tracked down this option that deserves its own space. 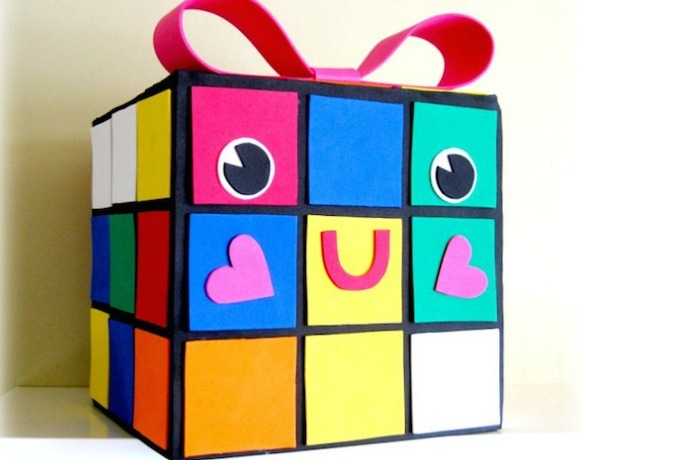 If your kids need to bring their own mailboxes to school for Valentine’s parties, not sure we’ve seen a more fun, geeky option than this DIY Rubix Cube Valentine’s Day mailbox craft. Even little kids can help glue the colored squares on their own boxes as long as you do the prep work for them. And if it comes out half as nicely as this one, it could be one they want to use next year, too.